November 18, 2016- (Mansfield, TX) AngMar Retail Group announced today Joey Dello Russo has been promoted to Director of Operations. The move puts Dello Russo at the helm of a rapidly growing collection of businesses owned by the Mansfield-based company. In his new role, Dello Russo will oversee the operation of Southern Oaks Golf Club, Marksmen Firearms, House of Hotrods, Fat Daddy’s Sports & Spirits, Fireworx, Smokey Mae’s and Autoworx. Previously, Dello Russo served as Director of Operations over Autoworx, House of Hotrods and Marksmen Firearms. 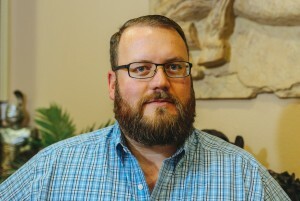 He led the planning and opening of Marksmen’s second location in Killeen on October 1st and is executing the opening of a third gun store in Benbrook in February of 2017. “We are experiencing explosive growth in our retail segments and Joey has proven through his work ethic, loyalty, high execution and dedication to be the person to help lead each of these companies forward to a bright future,” said John Geyerman, Vice President of Operations. Dello Russo has a graphic design degree from the Art Institute of Dallas. His early career includes art director and production management roles for publications across Dallas-Fort Worth. He transitioned to sales and marketing for small business, helping set standards for branding, design and digital transitions. He was hired by AngMar in 2008 to do graphic and web design. In 2010, Dello Russo took on expanded role in retail operations. As the retail division grew, Dello Russo was instrumental in setting the standard for each business in terms of management, service and growth. More recently, AngMar promoted Dello Russo to an assistant general manager position, then general manager. AngMar is a privately owned organization consisting of a variety of corporate holdings, LLC’s, DBA’s and other subsidiaries across the United States and headquartered in North Texas. Whether it’s home health care services, high performance race and street cars, live-music venues, golf, events or shooting sports and services, AngMar takes great pride in providing the best customer care possible.